We are always looking for ways to serve in our community with our children. Giving up your time to help someone less fortunate is an ideal way to teach children to put others before themselves and to be the being the hands and feet of Jesus. 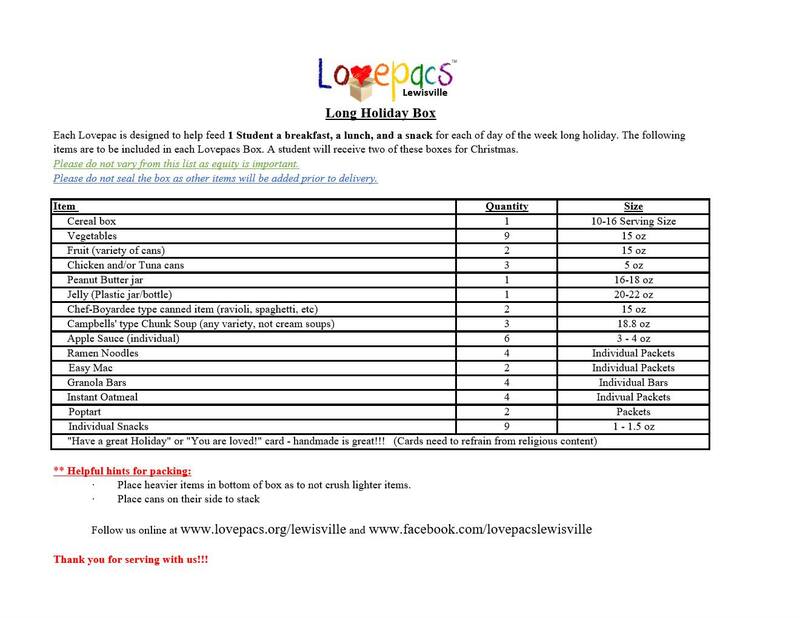 We recently volunteered to help pack meal boxes for Lovepacs - Lewisville. 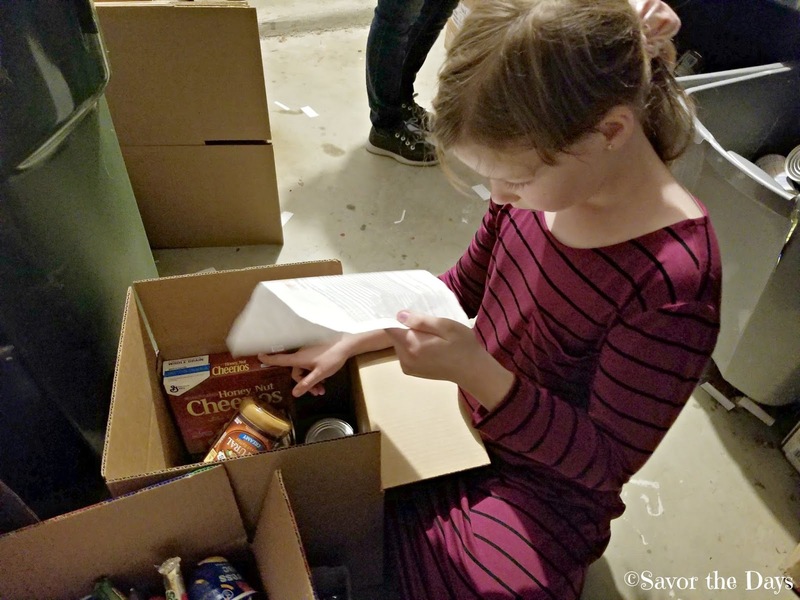 There are several homes in our area that serve with this organization. 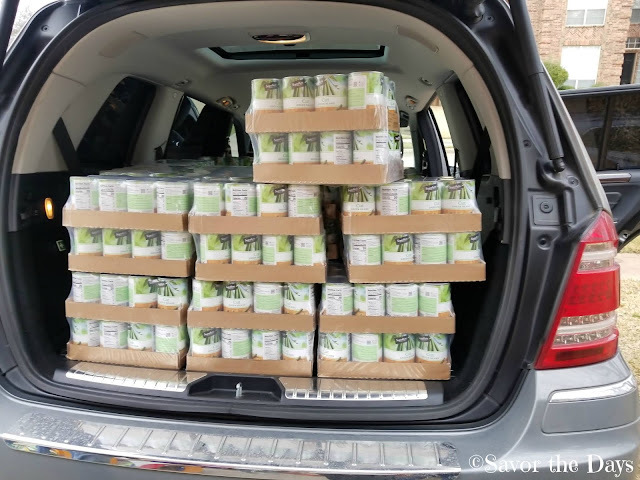 Essentially they pack up boxes of food to help children in our community. Low income children get free lunches at their public school. 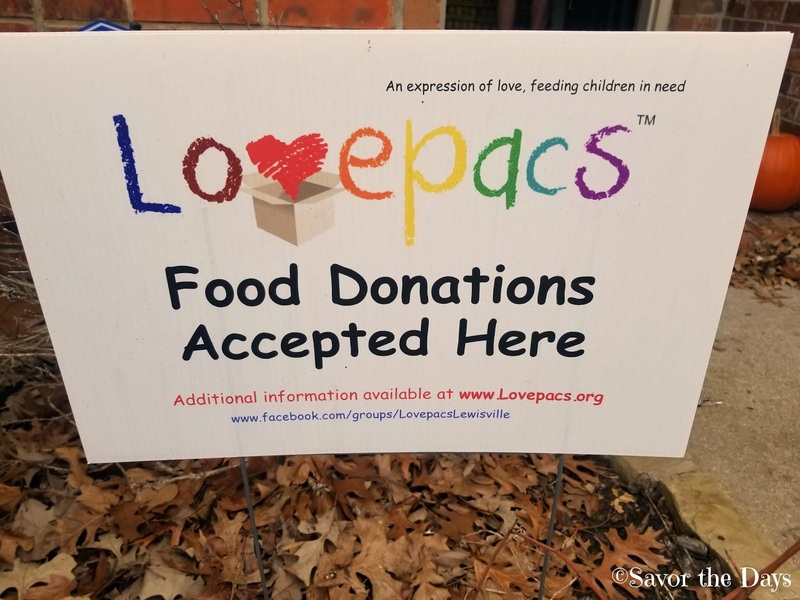 However, when school is out for breaks, Lovepacs still provides food for the children to have at home. 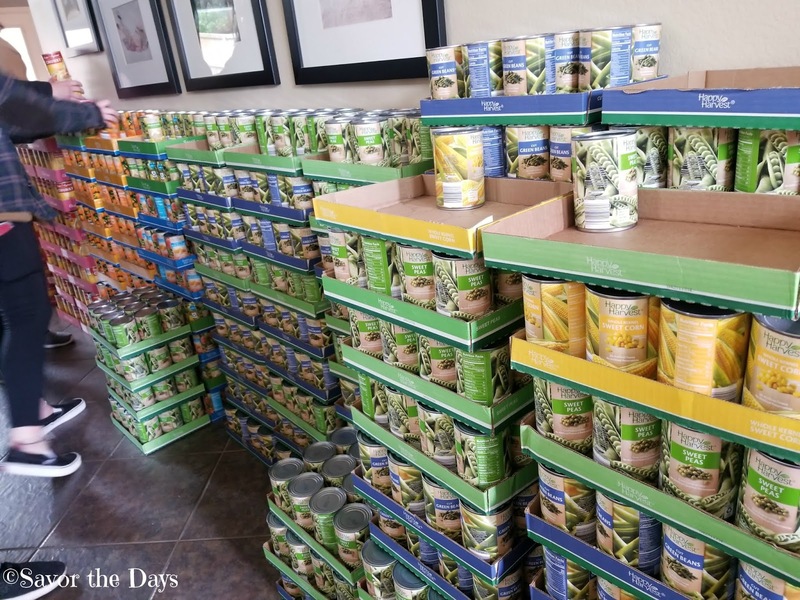 A local family uses their house to collect food donations and regularly schedules packing and delivery days to get the food to children in need. We showed up for a packing day. This family has completed opened their house for this project. There was food stacked up lining all of the rooms downstairs including the garage! There were a lot of people crowded in the house too, all wanting to help feed the children. We were giving a packing list of which items and how many should be included in each Lovepac box. This is also the list of items that they pray regularly for donations. 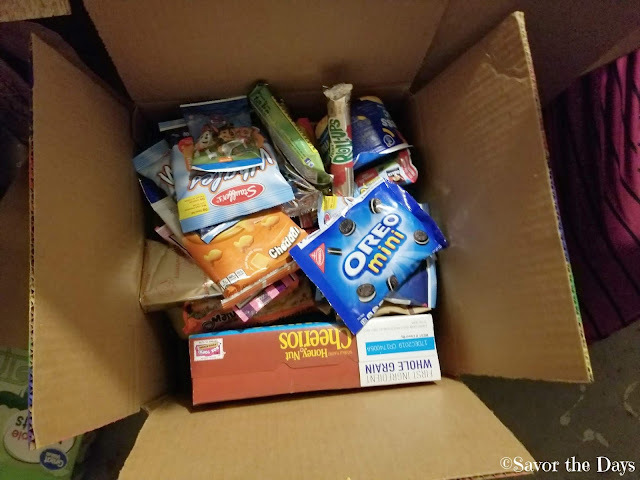 We went down the line and filled box after box. Each box contained cereal, soup, canned vegetables, peanut butter, jelly, canned meat like tuna/chili/chicken, canned fruit, granola bars, poptarts, ramen noodles, and some individual snack items. At one point we ran out of canned vegetables so someone made a run to the store and brought back a full supply for us. 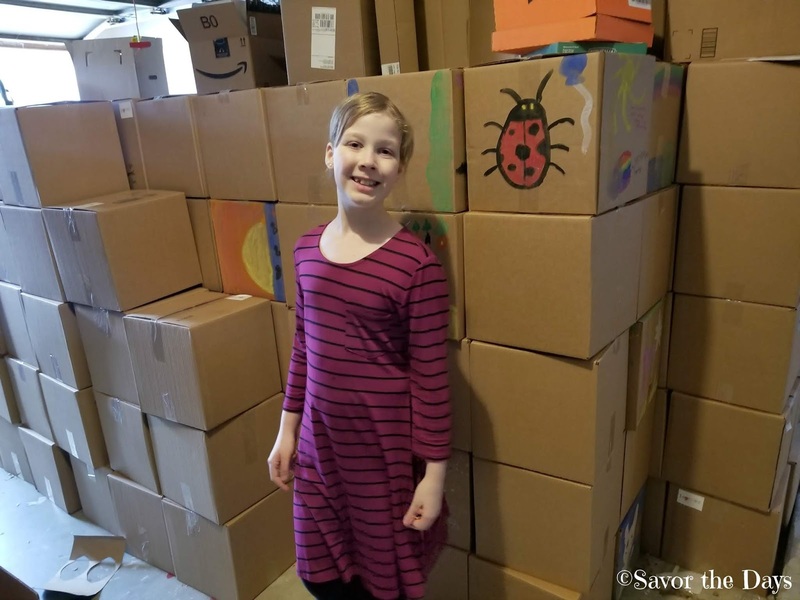 There were hundreds of boxes packed and then other volunteers helped to deliver them to the schools to be passed out before the next school break. Lovepacs is a great organization to volunteer with. There official website is http://www.lovepacs.org/ You can go there to find a group in your area to serve. Blessings! We are a hockey/figure skating family. We spend all of our time at the ice rink and everyone there knows us. Although we've seen it a zillion times, we still enjoy watching the Zamboni ride around the rink as it smooths out the ice between hockey games and skating sessions. 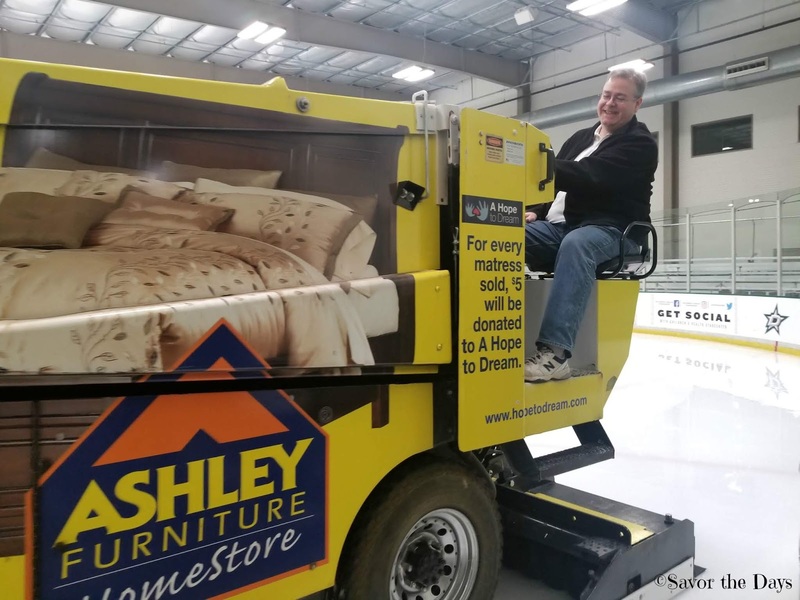 Last year Stuart mentioned several times that he would love to drive the Zamboni, just one time. It was a "Bucket List" item for him. 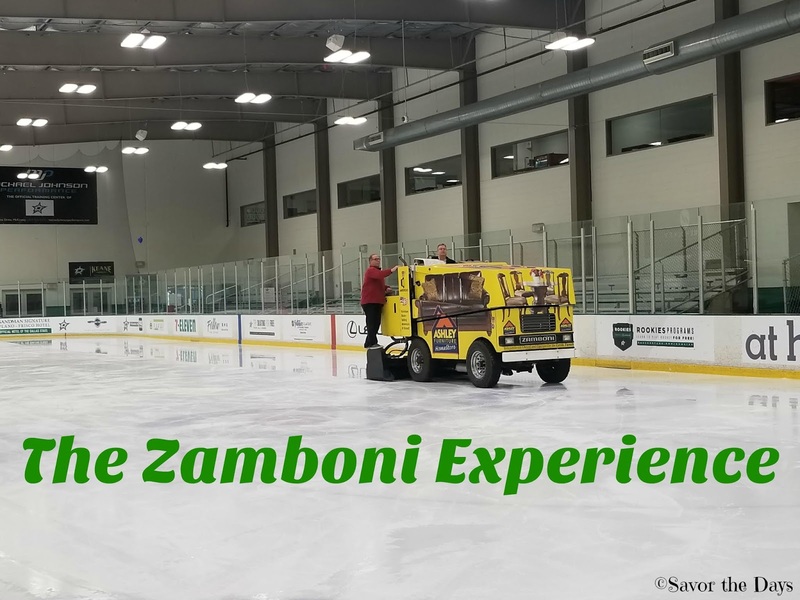 So for his birthday this year I asked around and found out that our ice rink offers a "Zamboni Experience"! I told Stuart that he had to take the day off of work for a birthday experience but I didn't tell him what he was doing. 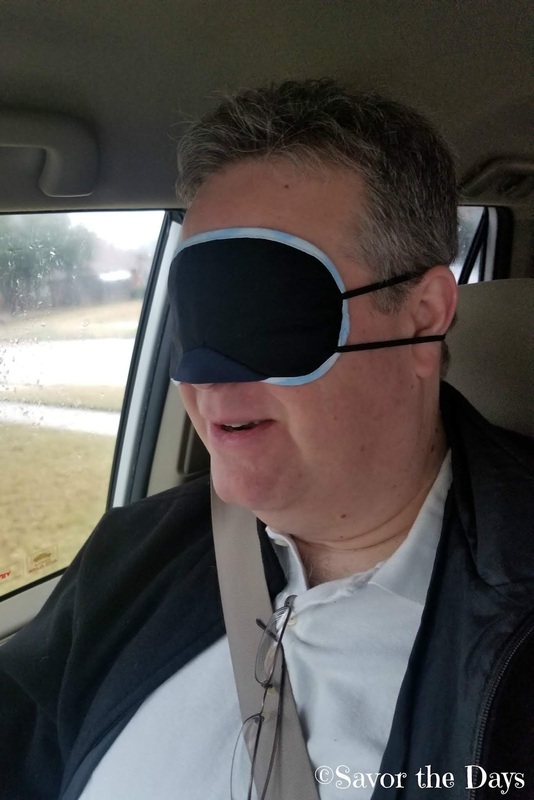 I made him wear a blindfold while I drove him a round about way to the rink. 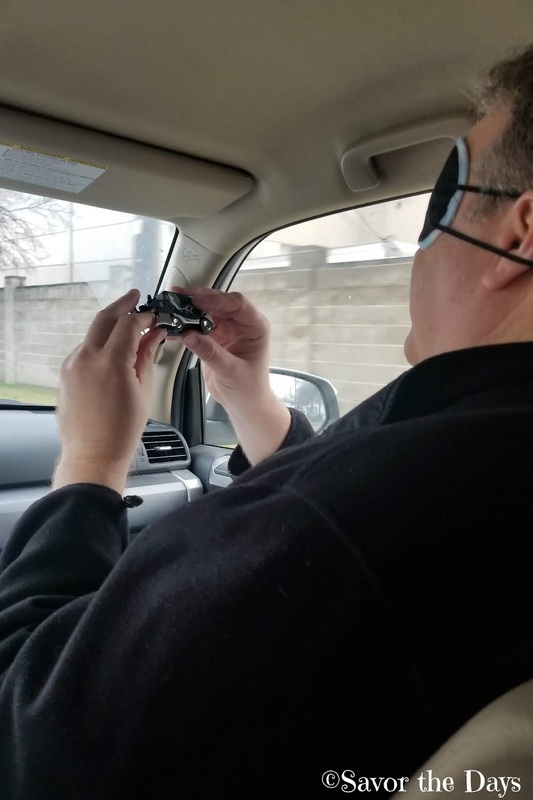 When we were almost to the ice rink, we gave Stuart a little hint of what he was going to do. It was a little toy Zamboni but he had to keep his blindfold on and just feel the toy to try to figure it out. It took him just a few minutes to guess what it was but he still didn't understand what we were going to do. He was pretty excited when he learned about his birthday surprise! 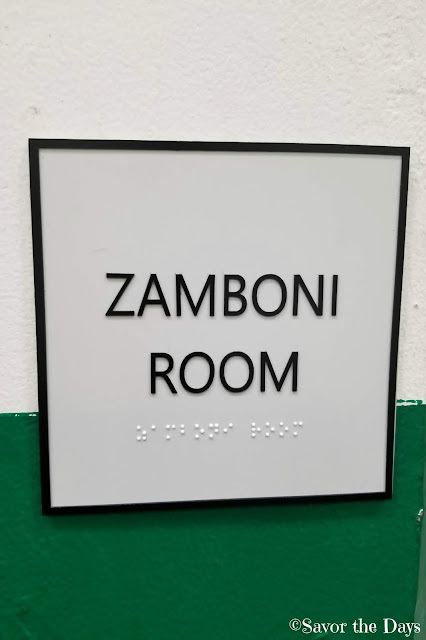 But we were going to get a tour of the Zamboni Room and learn all about the machine before he would get to drive it. I think he was happy about this because I think he had gotten a little queasy from the long blindfolded ride with me driving and needed to let his stomach settle before driving heavy machinery. I might have made the drive a little too long but I wanted to get him completely turned around so he wouldn't know where we were going! 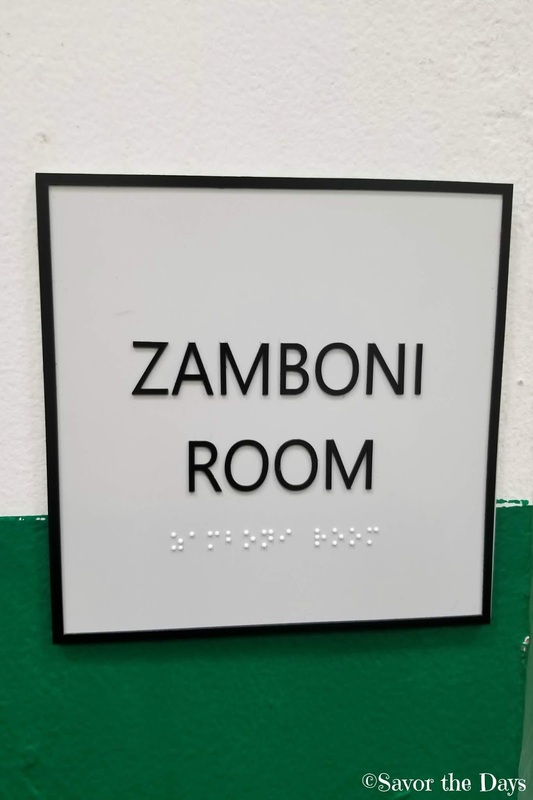 We have never been in the Zamboni Room so we were all excited to get a chance to go behind the scenes. 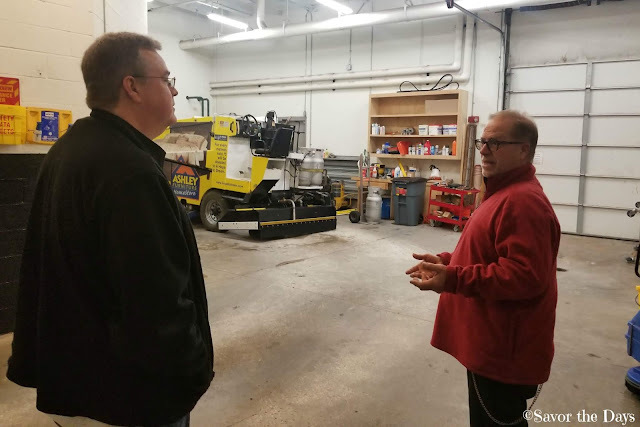 The Zamboni expert was on hand to teach us everything we might ever want to know about Zambonis. Here it is! 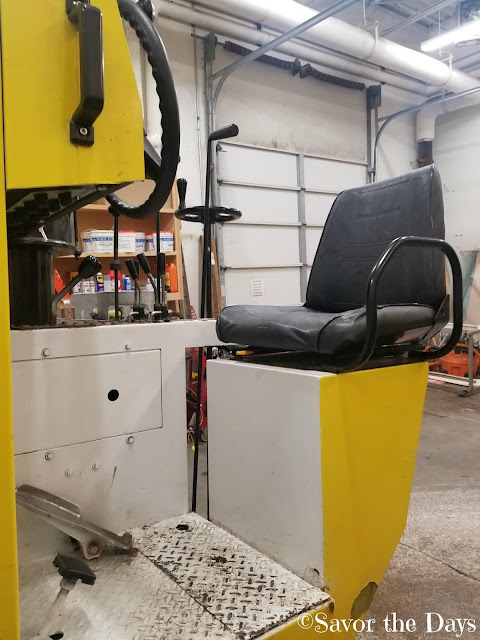 The coveted driver seat of the Zamboni! The Zamboni was patented in 1928 and was name after Frank Zamboni. 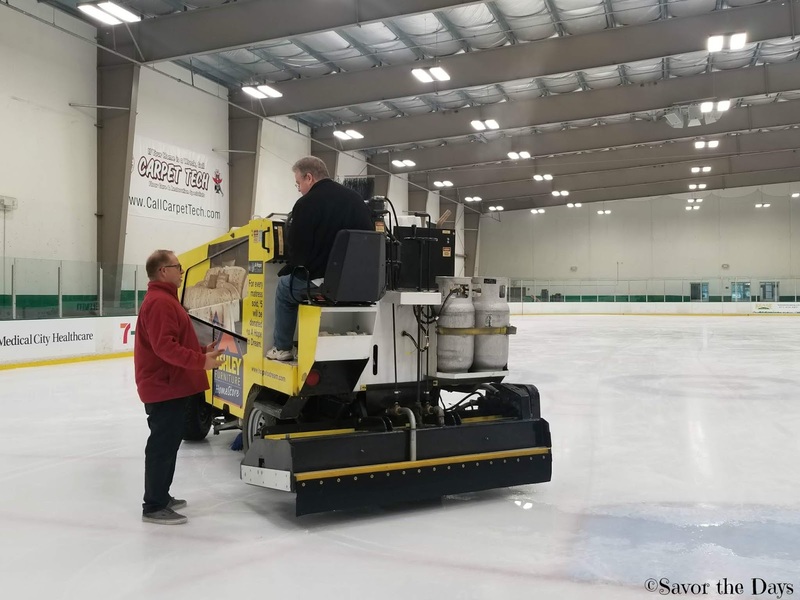 This particular Zamboni runs on propane fuel and has a Volkswagon engine. 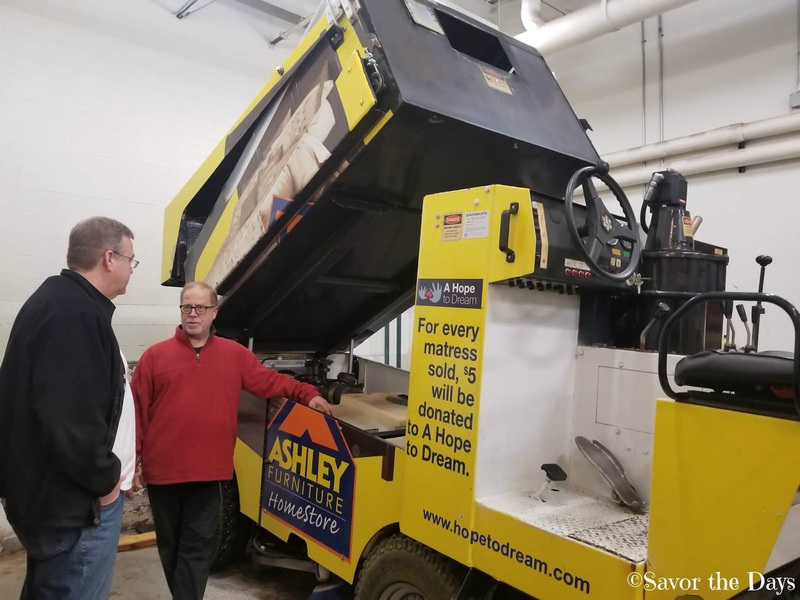 As it resurfaces the ice, it can remove around 2,500 pounds of compacted snow while it can leave behind about 1,500 pounds of water. The blade on the machine weighs 57 pounds and is 1/2 inch thick. Fascinating facts. But ok. Enough chit-chat. Let's do this! 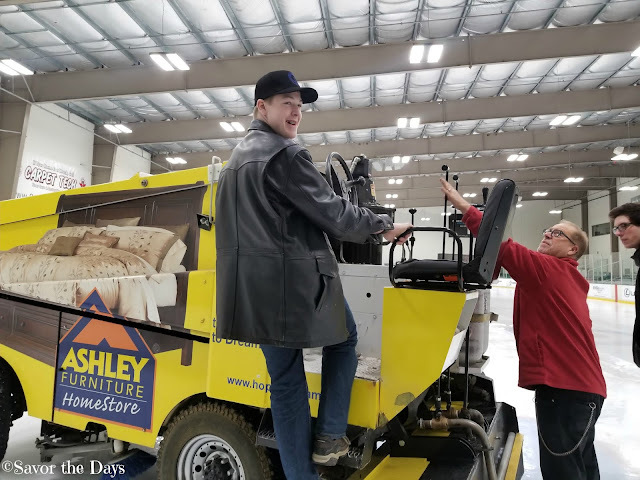 Here is a video of Stuart's first time driving the Zamboni around the rink. He was not spraying water and the blade wasn't down. This lap was just to get the hang of driving the behemoth. Look at that smile! I think he was having a pretty good time! 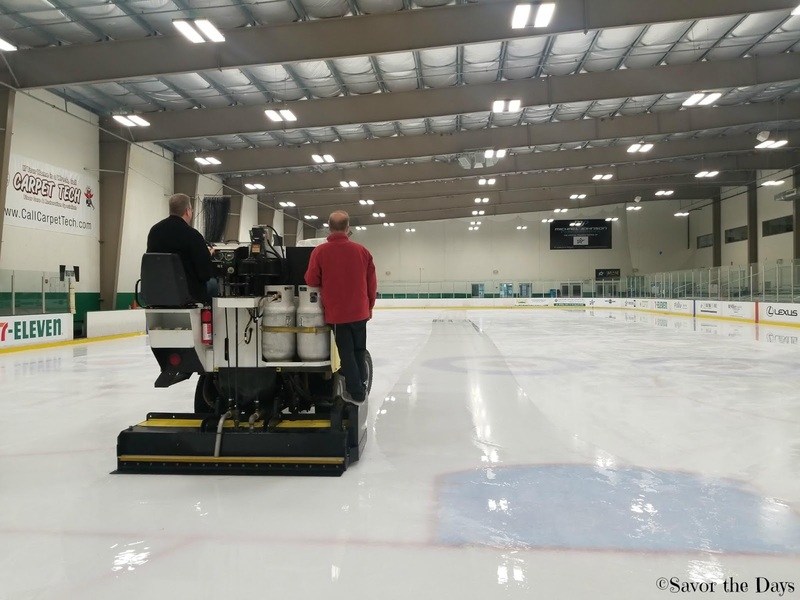 Now let's spray some water and actually smooth the ice. Here's another video of Stuart actually resurfacing the ice. Look at the nice shine on the ice! That's some professional looking ice right there! The kids were hoping that they would get a chance to ride along with Daddy. And they did!! Rachel went first. 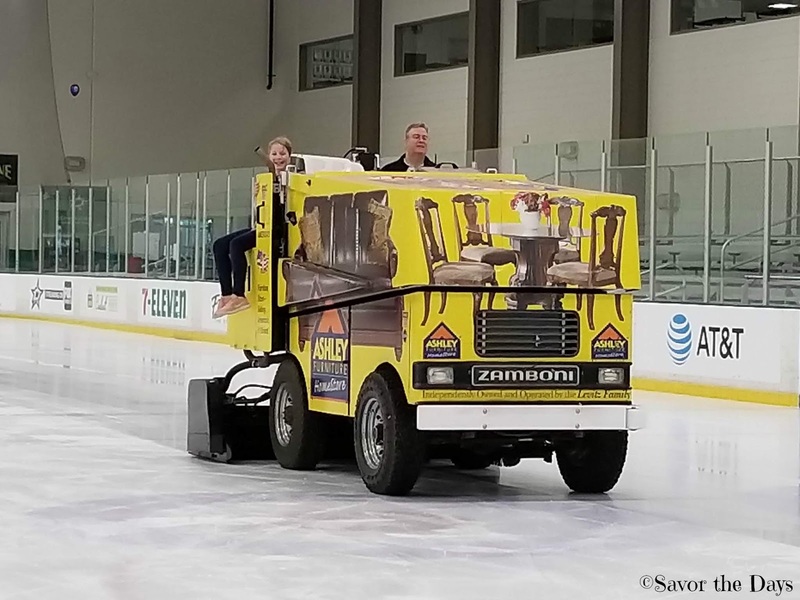 Here's a video snippet of Rachel's Zamboni ride. She was so excited! Then we were all surprised when the Zamboni guy told Nicholas that he didn't get to just ride on the Zamboni but instead he was going to DRIVE the Zamboni! We quickly told him Nicholas' age just to be sure he understood that he doesn't even have a drivers license yet but he was still cool with him driving! Of course, here is a video of Nicholas driving a Zamboni. He was nervous but he did really well. 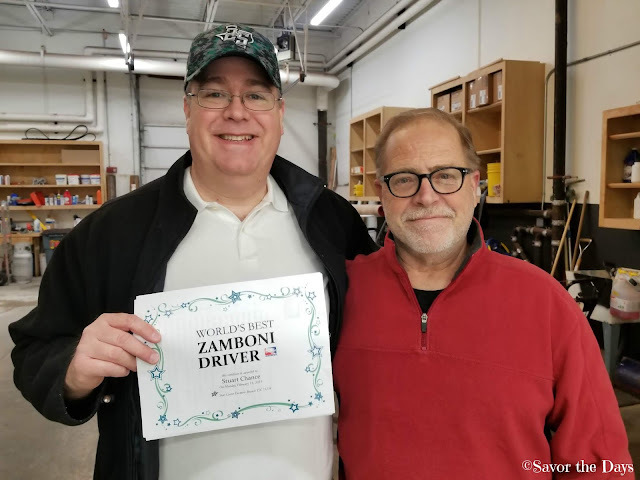 It's pretty neat that he has driven a Zamboni and flown an airplane before getting his drivers license! We were all sad when the time was up but Stuart was still grinning from ear to ear. Bucket List item: Drive a Zamboni. Check! Happy birthday to the "World's Best Zamboni Driver"!